Included the hotfix meshes in the MAIN file. Corrected the missing files from the hotfix BSA. Corrected missing first person weapon models. Added missing textures that were left out of the archive accidentally. Reduced drop rates of items from the leveled lists. Fixed some items using incorrect data types. Corrected Keywords on many items. Many grammar and punctuation fixes. Balanced the Crusader's Armor set. Corrected the Crusader Armor EvoSys from giving multiple Restored Crusader's Armor. Removed unnecessary flags on some static items. Fixed evolved items duplicating when used by followers. Added keyword to prevent many items from being dis-enchanted. Main file now has 1k Textures as standard. 2k textures now an optional download. Resaved Plugin to fix form version. Added missing keywords to some weapons. Archived the files into BSA's. We’ve all been here: you're traipsing through a dungeon, slaying all sorts of threats to your existence but finding limited loot. After a trek, you enter into the boss chamber, steeling yourself for the fight. Using skill or guile you slay the boss, open the chest and expecting something worth your time. Now, what if these bosses had some special items stashed in the chest? Additional loot like jewelry, relics and recipes to loot long lost to the annals of time? After all, these dungeons have been sealed - they haven’t been opened for ages and who knows what existed at that time. Plus, your typical bandit's taken one too many blows to his helmet - you think they can distinguish rare relics from whatever other shiny weapons they have? It would easily offset the soured feeling of having to listen to her. AGAIN. Well...wonder no longer, adventurers. Behold! 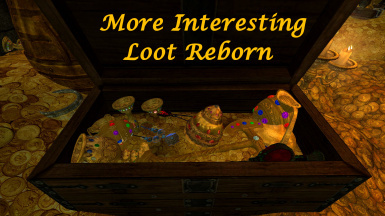 This mod is the spiritual successor of More Interesting Loot by Ghengisbob. Initially, the goal was to make a patch for Legacy to address the elusive drop rates. However, the more I looked into the mod's innards the more I was astounded at how much looked like it was just… abandoned and unfinished. Now don’t get me wrong, I LOVE More interesting Loot, but I saw so much lost potential that I decided to rebuild it from the ground up. Like I mentioned, the drop rates were… less then ideal even with everything set at a very high drop rate, even with the MCM menu maxed out. My method of loot distribution is far different from his, making use of various entries and injections into chests all across the worlds to make it fit. This leads into my next point. We’ve all seen the containers scattered across the dungeons: the urns in Nordic barrows, some Dwemer chests, and the ilk being empty. It makes sense for some to be empty but not most of them - they are sealed dungeons, abandoned long ago. Would it make sense for a piece of Dwemer armor to be in something like a small chest on the wall? No, that chest isn't the TARDIS why would anyone stuff something big like that in there? The chests and containers are going to reflect their dungeons and locations as well. 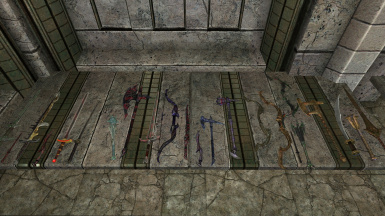 For example, would you find Elven stuff in draugr-infested tombs? Unlikely, but you would have a greater chance at finding snow elf loot in there as they were active during that time. V1.0 is the initial release, and as such the loot list is… limited, containing only the greater relics from across the 5 core games. However, my roadmap (as seen in articles) has plans of additional, lore friendly loot as well as forwarding the old effects from other games as best I can without TOO many issues or extra heavy scripts. Short for Evolution System, EvoSys (pronounced Evo-cis) is a process where the items you wield, whether they be armor, jewelry, or weapons will “grow” with you -- evolving into progressively stronger forms. Say you find a steel dagger at a high level, and it seems to be of suspicious quality or is humming with mysterious power. Go ahead and use it - who knows it very well may evolve into something… well, more! Now, we all can remember how a certain artifact from Morrowind had something that was then a powerful enchantment. When you find the relic in Skyrim it's just an echo of what it once was. lolKeening Not anymore, or at least if you use it enough. By using EvoSys, the item will eventually ‘recharge’ itself, restoring lost enchantments as well as regaining ones it used to have, all being lightweight in terms of scripting. This process was very, very, VERY, raw and unrefined within the original mod - Ghengisbob only had a single item running this system with some odd usage. I along with several other members of the community took the raw system and completed it making it able to work on just about any possible equippable item in the game, modded or otherwise. Now these leads into the credits of this mod, where currently there are a ton of credits to be given. But before we get there, I feel this needs to be said. I am a firm believer of Cathedral modding, that without the community I would not have been able to do what I have done. As such, if mod authors wish to add, or use the systems in place her I welcome its use; simply credit me and gengishbob and use the system guides I have in articles to learn, use, or even improve it (Just share any improvements with me please first ;P lol) Or, if you want to help, I am in dire need of additional item models as modelling items from scratch is beyond my capabilities. Given the amount of assets used, I don't have enough space here to do justice so please look in articles for credits. To the mod authors: if I forgot some details, or to mention you, please let me know and I will be happy to correct it.